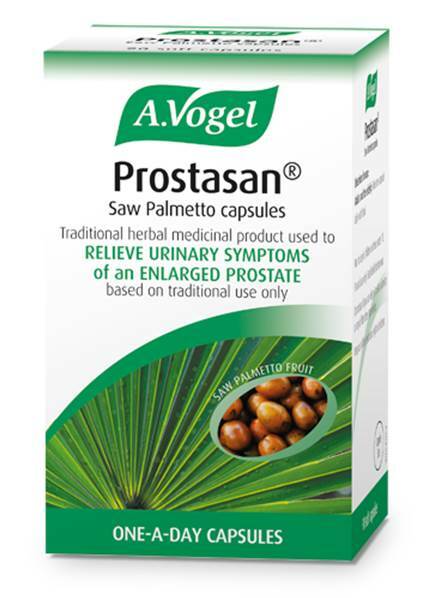 A. Vogel Prostasan is a traditional herbal nutritional health supplement used to relieve urinary discomfort in men with an enlarged prostate. Research into the effectiveness of Prostasan® Saw Palmetto capsules has achieved excellent results. Conducted by Swiss GPs, the study involved367patients who had an enlarged prostate (also known as Benign Prostatic Hypertrophy or BPH). Patients took one Prostasan® capsule daily for eight weeks. Prostasan® Saw Palmetto capsules had a very good efficacy in the treatment of BPH. Symptoms improved by 42% for patients with mild symptoms and 38% for patients with medium symptoms. Severe symptoms were reduced by 30%. All patients reported an improvement in quality of life. How do Prostasan Saw Palmetto capsules work? Prostasan Saw Palmetto capsules contain oils called Free Fatty Acids. These help to reduce the levels of dihydrotestosterone. How long does Prostasan take to work? Most people will see a gradual improvement after four weeks but it is recommended that you try it for at least three months for maximum results. Can you take Prostasan long term? Why is Prostasan in a gelatine capsule? The oil is extracted from the Saw Palmetto berry by a unique process. Keeping the oil in liquid form ensures a more potent and effective remedy. However, because the oil is in liquid form, a vegetarian capsule would not be suitable. Most companies that supply their Saw Palmetto in a vegetarian capsule have dried the oil to a powder in order to do so. Why have you made it a 320mg capsule? Various studies around the world on Saw Palmetto have found that the optimum benefit results from a dose of 320mg. Take less and it is not as effective but if you take more it will not work any faster. Extraction solvent: Ethanol 96% V/V The other ingredients used for the capsule shell are gelatin, glycerol, sorbitol, iron oxide (red, black and yellow) and purified water. Do not chew the capsule. Refer to your doctor before stopping any prescribed medicine.